Property Information - Get the "Best of Both Worlds" with this charming lakefront cottage on a quiet circle in Dennisport, Mid - Cape Cod. You have waterfront access right outside your back door with gorgeous views of Swan Pond and conservation land. Spend time on the lake or at Sea Street or Glendon beach down the street. 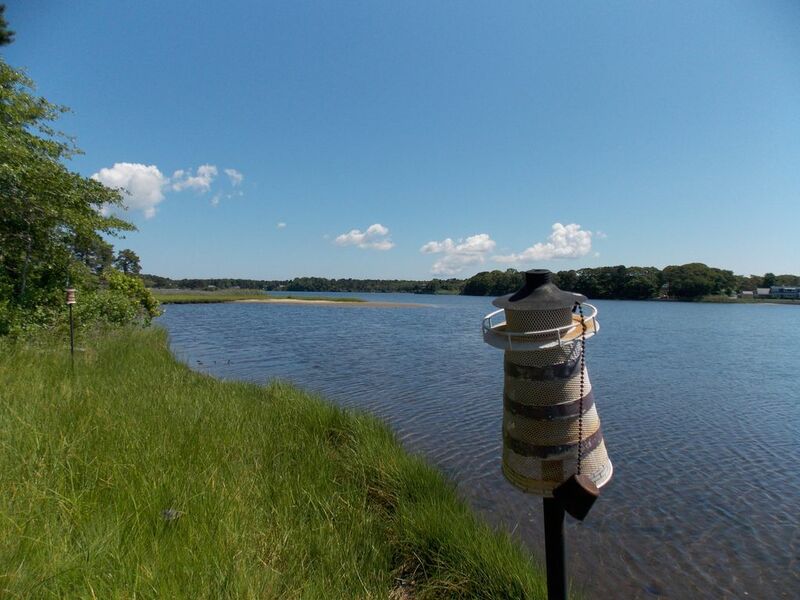 Swan Pond is about 1.5 miles long and connects to Swan River - which connects to the beaches and the ocean on Nantucket Sound. Fish, kayak, canoe, sail, windsurf or just relax on this very beautiful lake, it’s up to you! The cottage has a new deck and a private back yard that is spacious enough to entertain or just relax while watching the gorgeous views and wildlife. Swan Pond is known for its great fishing and canoeing, this lake has no public access for motor boats, so it’s very quiet. The cottage has 3/4 bedrooms, (NEW), Loft - with 2 single beds. one bath, outdoor shower and can sleep up to 8. It’s newly refinished with NEW floors and and comes with a canoe, 2 kayaks, (NEW) 6 person aluminum row boat, inflatable boat, microwave, cable TV, WIFI, Roku Streaming, washing machine, dryer, kitchen supplies and grill. It’s a great way to enjoy the Cape Cod lifestyle. The cottage is conveniently located to the beaches, bike trail, and restaurants (Chapins, Sunday School, etc.). You can even walk to Clancy’s Restaurant. Master bedroom #1 – Queen Bed over looking Swan Pond with Private Sliding door to the private back yard. Living Room – Views of Swan Pond, (NEW) Love Seat, (NEW) Sofa, Cable TV, Flat Screen TV, VCR, DVD, Streaming Device, Netflix, Internet, NEWer wood floors, and extra comfy chairs. Kitchen – Eat in Kitchen over looking Swan Pond. Comes with: microwave, stove, fridge, coffee maker, plates, cooking utensils, silverware, lobster pot, Kitchen table seats 6-8 comfortably. Great for entertaining and cooking. NEW - Patio By The Water. Bluestone patio with table, umbrella and only 10 feet from the water. Perfect location to enjoy a nice dinner or read a book. Laura and I live on the North Shore about 20 minutes North of Boston. We are two working professionals with two beautiful daughters. Both Laura and I came from families that would make it a tradition to plan their annual vacations on Cape Cod. We were married at the Lighthouse Inn on West Dennis Beach. The area has always been a draw for us and we were always looking for reasons to visit. That's when we decided to purchase a home in Dennisport. We are happy to share our getaway with travelers and we hope you and your family will have similar memories of the Cape that we have created. The cottage has been visited by people from around the world. Some recent visitors have traveled from Hong Kong, Canada, Denmark, England and many states throughout the US. Recently, we had a couple exchange wedding vows in our backyard. Location, Location, Location! Its all about location! Fresh/Salt water lake with a river that's connected to the local beaches, being less than 2 miles from some amazing beaches on Nantucket Sound - was some of the draws to purchasing our cottage. We also love the street being located on a quiet circle - it makes it safe for walking, riding your bike and or going for a jog. The yard is quiet and tranquil with beautiful views and easy access to the water. The lake is beautiful and very quiet. The back yard over looking the water is both private and well cared for. Great for BBQ'ing, relaxing on the hammock, sitting down by the water or having dinner on the deck. Some of our favorite benefits of being on Swan Pond is access tp the lake with the canoe and Kayaks. Having the private deck with water views is rare on the Cape and its something we look forward to every time we visit. The cottage is always very clean and comfortable. Decorated with traditional Cape Cod décor, the cottage offers water views from almost every window. Swan Pond cottage is a year round cottage that is available to rent in the off season. So, if you are looking to get away and would like water views in the Summer, Fall, Winter or Spring - please consider the beautiful views from our cottage getaway. Every season on the Cape is unique, especially on Swan pond. Hyannis is only 15 minutes away. Chatham is only 15 minutes away Provincetown is 30 minutes away Yarmouthport is only 5 minutes away. A number of golf coures in the area. Many miniture courses too. You can launch your canoe or kayaks right from the back yard. The house is 30 feet from the pond/lake. Exceptional views from almost every window of the house. 5 window AC units in house. Year round home with baseboard heating. ($100 fee) Linens can be provided through our cleaning comnpany for a fee of $100. This includes bath towels, beach towels and bed sheets. (Fee)Can be provided for an additional cost. Provided by our cleaning company. we have 2 different coffee makers. Keurig 1 cup maker and the traditional coffee pot maker. Dinning Room: Table for 6. Built in Leaf making a table for 8. Outdoor deck - Seating for 6. Large assortment of paperback books. Assorted DVD's. RedBox located 2 miles away for current and recent movies. Professionally landscaped and maintained weekly. This property has an assortment of flowering shrubs, roses, sea grass and native trees. Indian Trail Road cottage has a NEW canoe, rowboat with life jackets, paddles and 2 kayaks that can be launched from the back yard. There is also an outdoor shower with both hot and cold water. In the back yard their is a back deck, waterfront patio overlooking the lake and a picnic table closer to the shore line. Take the day and explore the lake and its two islands or paddle over to Clancy's Bar and Grille, continue down to the mouth of the lake towards the scenic Swan River which connects to the beaches on Nantucket Sound. Beaches are only 1-1.5 miles down the road. The location is perfect for walking and biking. Located on a circle that is not well traveled. Beautiful nicely landscaped neighborhood. Friendly neighbors and summer vacationers. We had such a nice visit with my family. The house was very cute and cozy and accommodated the space that we needed. The backyard was great and view of the pond was beautiful. I wish the weather was better so we could have enjoyed it more! Wonderful spot on the pond with everything you need! The cottage was adorable and had everything we needed for a long weekend away. Our boys loved the loft and enjoyed watching movies up there at night and having their own space. We all enjoyed the outdoor space more than anything else, though. This spot on the pond was beautiful. Having the kayaks, canoe, and boat at the house (along with all of the paddles) made packing a breeze since everything was already at the cottage. The hammock provided a nice space for a little relaxation and there’s plenty of outdoor seating. The yard was a good size and had plenty of space for games. The fishing from the back yard was amazing...fish were literally jumping right out of the water, which provided tons of entertainment for our boys. The only negative we experienced was the bugs (they were fierce at night), so we had a little fire in the chiminea and lit some of the citronella candles that were available at the cottage. We had so much fun at the house, we only ventured out to the ocean once! We had a great time at the cottage and hope to be back again next fall. This was our first trip to Cape Cod and we feel we picked the perfect place to stay. The location is great - close to everything. The cottage is clean, decorated beautifully, spacious and comfortable. My husband and three daughters and I had plenty of room to spread out and make ourselves at home. The backyard is peaceful and scenic. The Somes have thought of everything you might possibly need - deck with table and chairs and umbrella (with patio lights! ), hammock by the water (my husband loved this), kayaks, canoe. Everything was well-kept and very nice quality. John quickly responded to any questions I had and was very pleasant to work with. We couldn't have asked for a better place for our vacation. It is truly a lovely place to stay. Jennifer, thank you for choosing our cottage and for the kind words. The Cape is truly a beautiful place to vacation with so much to offer. Have a great rest of the summer and thank you for visiting our cottage. Your always welcome any time of the year. What a lovely Cape house to rent! My husband and I choses this house specifically for the pond location. After a day at the beach, or if you wanted to just laze around, you had so many options at your fingertips; Kayaks, Canoe, hammock naps, lawn games. We adored the charm of the Somes' home! Especially the outdoor shower which is a MUST down the cape! Thank you, John and Laura, for opening your home to our family. We truly enjoyed every second of our stay! What a wonderful cottage for our family Cape Cod vacation! Just to mention a few features, there are three charming bedrooms, clean bathroom and a great outdoor shower. Very comfortable living room with a large TV and lots of books. The dining area has spectacular views of the water. We spent many nights and morning eating on the outdoor deck. The private back yard has lovely views. Our family enjoyed the grassy backyard area for badminton, volleyball and croquet. The kitchen has many trays, bowls, glasses, and silverware that you could possibly need, and so many other supplies that all you will need to bring is your food and drinks! The kids also enjoyed the use of the kayaks, canoe and being on the lake. The neighborhood is great for walking, biking and jogging. Martha’s Vineyard ferry is just a hop away. I think you would be hard pressed to find a more peaceful, comfortable and beautiful place to stay anywhere on Cape Cod! Thank you John and Laura for a memorable vacation. This was a perfect getway for our family. The single floor layout was great for my mother (in wheelchair). My two boys 2 and 4) loved the bunk beds, and it was great to have the additional third bed in their room for when the novelty of the top bunk wore off. My wife and I were in the third room. Plenty of space for all, on a quiet road, a beautiful lake, and direct kayak and canoe access out onto the water. Could not have asked for more. PAYMENT OPTIONS 1. Payment thru VRBO VRBO has set up a service fee (around $158+) and if you make a payment by CC - we have to charge an additional 3% or 5% for international fees. If you would like to pay by an electronic check - there will be no CC fees just a service fee. 2, Payment thru us directly A option that we have provided our travelers in the past - is paying us directly by check. This would waive the $158+ service fee and the $500 security deposit can be paid later. we will also break the payments into two payments 50% down to reserve and the 2nd payment of 50% 4 weeks prior to move in. A separate security check for $500 is paid 4 weeks prior to move in and returned as long as there are no damages. For International checks - please add 5%. Option 2 save you around $200 Hope this is helpful. We are fine with either method.